Like so many other baseball and baseball card sites on the web, I decided to start making my own cards. However, I’m not content with just making virtual ones that get posted to 14,000 Phillies. 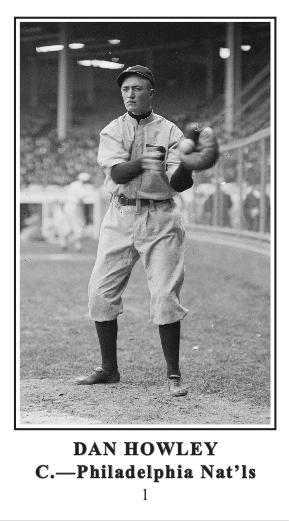 Instead, I pulled out my copy of QuarkExpress and created a template loosely based on the M101-4 design (what can I say, I wanted to make this easy on myself) which allows me to print black and white baseball cards on Avery 27871 business card stock. 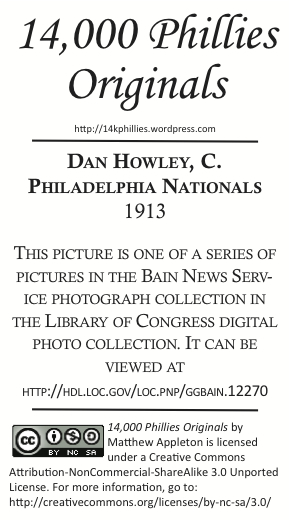 Then, going into the Library of Congress Digital Collections, I found a series of vintage Phillies photos with “no known restrictions on publication” (I am very mindful of keeping my nose clean when it comes to infringement), determined which Creative Commons License worked best for the project, and viola! I bring to you the 14,000 Phillies Originals. I only have the first card complete at this time, but I hope to have the first series of 10 cards complete within the next few days. I will freely offer the completed product — as a PDF email to you so that you can print them yourself– to anyone who asks, but if you ask nicely, I can be persuaded to print them myself and mail them out. Furthermore, I am willing to create these cards for collectors of other teams. I will post more complete details when I complete the first series. As I said before, I am very respectful of copyright, so for the time being nearly all the cards will almost certainly be of vintage Phillies. However, if I can find ways to legally use more recent photos (most likely under the auspices of fair use), then I will re-address this situation later.